The Taylor Daily Press reported today that Williamson County renewed the Corrections Corporation of America's lease to operate the T. Don Hutto Residential Center in Taylor, Texas. Of course, the lease renewal was probably a foregone conclusion since Williamson County stands to make over $15,000 per month on the deal. Additionally, CCA rakes in about $2.8 million per month from ICE (a federal government agency) to house up to 512 inmates. The new contract does ask that CCA provide education for the imprisoned children in accordance with all state and federal education standards and guidelines. Advocates will have to make sure that CCA and ICE don't run a truck through that provision by claiming that special rules for incarcerated immigrants. Catsimatidis: "I Want Illegal Aliens"
"When you talk about illegal aliens, they have a purpose too. I want illegal aliens, and I'll support them if they're paying their taxes, hard working families. But if they're here to live off the rest of us, then I'm not going to support them. If they're here to commit felonies and murders, I'll have them on the first boat out." 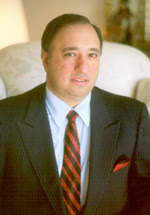 An Ellis Island Medal of Honor recipient, Catsimatidis was born in Greece in 1948 and brought to the United States by his parents while still an infant. Raised in New York City, Mr.Catsimatidis attended high school in Brooklyn and then New York University. Mr. Catsimatidis and his wife Margo Catsimatidis have two children; daughter Andrea John, “AJ” 10 years, and son, John Andreas, Jr., “Yianni” 7 years. John Catsimatidis is Chairman and the Chief Executive Officer of the Red Apple Group, Inc., a privately held company with annual sales of over $2 billion and 10,000 employees. 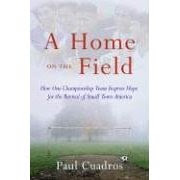 A Home on the Field: How One Championship Team Inspires Hope for the Revival of Small Town America, (Rayo-HarperCollins) by Paul Cuadros, tells the true story of the Jets, a high school soccer team made up of Latino immigrant kids in rural Siler who shocked the soccer world in North Carolina and made it to the state championship finals in just three seasons. Paul Cuadros is an award-winning investigative reporter who has written about issues of race and poverty for more than ten years. In 1999, Cuadros won an Alicia Patterson Foundation fellowship to report and write about the migration of Latino workers and their families to the rural South and moved to central North Carolina. At age 15, Georgina Vanegas Hernandez left her family in Michoacan, Mexico, and moved to the United States. With help from the minister of her church and his wife, Hernandez became a legal resident and was an honor roll student in high school. She's now a freshman at Lexington, Kentucky's Transylvania University. She is one of the increasing number of Latinos living in the Bluegrass and going to college. For example, the University of Kentucky reported a dramatic increase in Latino freshman enrollment, an all-time high of 57, up from 37 last year. Nuestro Kentucky is a monthly photo column focusing on life in Kentucky's growing Latino community. An increasing population of Latinos from other countries and other parts of America are choosing the Bluegrass to live, work and play. Each month in Communities, a single photo will explore an aspect of life in this often overlooked population. If you haven't noticed, I love that Latinos are finding their way to the South and planting roots in Dixie. Tennessee is no exception. From Memphis to Chattanooga and from Knoxville (where Bilingual in the Boonies blogs from) to Nashville and rural hamlets in between, Tennessean's are learning what it's like to live in an America that's more than just Black and White. For example, according to the Tennessean's Multiculturalism has changed what we do (12/18/06), 13% of Metro Nashville school students are Latino, with six schools of 133 being majority Latino. Marsha Warden, chairwoman of the Metropolitan Nashville Board of Education is quoted as saying: "The face of the Nashville community has changed, with a much richer diversity that should be embraced." Ms. Warden is a wise woman. Visit HispanicNashvilleNotebook for more information on the transformation of Latino Nashville. Below is the Orwellian response from a former Corrections Corporation of America employee to my "Imprisoned Immigrant Children Denied Education" post of January 27, 2007. The T. Don Hutto unit is very well outfitted for families. Each family stays together (Mother, Father and Child) and are offered a variety of other programs. The living conditions are similar to a studio apartment for each family. Oooh! Where do I sign up my family? It’s a freak’n prison! So what that the families are together—they’re together in a PRISON! But the facility offers a variety of programs. Well, so do Sing Sing and Attica—and they’re still PRISONS! The difference is that Sing Sing and Attica are not imprisoning children and the prison inmates don’t include people known to be unquestionably innocent. Unless Immigration and Customs Enforcement (ICE) mandates it, or there is a GREAT public outcry, CCA won't spend the money on [educating the children]. The "detained" families get to spend quality time together at the T. Don Hutto resort in Taylor, Texas, and to make their stay even more amazing the state’s obligation to educate the kids is waived. I think CCA and ICE (now there’s an appropriate acronym) are onto something. When word gets out about the memorable times to be had--and for free--the country’s maids, nannies, lawn boys and grape pickers are all going to turn themselves in to ICE for their turn at the T. Don Hutto resort. ICE ices the immigrant families and CCA turns a nifty profit. It’s well documented that Puerto Rico’s massive and heavily centralized government is wasteful, corrupt and incompetent. Based on any measure, that government is a bust: sky high unemployment, a sky rocketing crime rate, poorly maintained infrastructure, poorly managed public hospitals and public schools without the basics. The solution? Flattening the national government by devolving responsibility, authority and resources to the political units closest to the people. Doing so would inject a measure of accountability that is simply lacking under the current arrangement. The empowered mayoralty would attract higher caliber leaders who in turn would seek innovative solutions to local challenges. Unfortunately, current governor Anibal Acevedo Avila doesn’t get it. The good news is that a hand full of mayors does--and they’re taking matters into their own hands. They have slashed their own municipal staffs while improving services. Caribbean Business identifies the innovative mayors as Ramon Luis Rivera Cruz of Bayamon, Jose Aponte of Carolina, Willie Miranda Marin of Caguas and Hector O’Neill of Guaynabo. These mayors want to do more but that requires an amendment to the Island’s constitution. 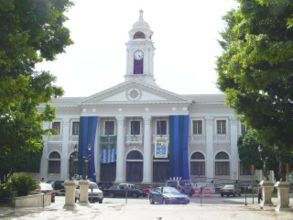 Historically, the island’s legislature has been served as an appendage of the San Juan-based political establishment. Their tendency has always been towards a larger and yet more centralized government, so the idea of now doing the opposite may unfortunately may be too much for that group. The only hope is that things have gotten so bad, and the prospects for yet another bail-out so remote, that the San Juan elites may see it as in their self-interest to push for the reforms, too. The immigrant saga "Padre Nuestro," about a Mexican teen's heartbreaking search for his father in America, won the grand-jury prize for best U.S. drama Saturday at the Sundance Film Festival. "Manda Bala (Send a Bullet)," another Latin American story recounting government corruption and kidnapping in Brazil, earned the grand-jury award in the U.S. documentary competition at the festival, the nation's top showcase for independent film. Taíno Elder Emiliano Mercado del Toro, R.I.P. Thank you for being the finest example of a true Taíno elder. May God bless you. Attorney Scott Medlock of the Austin-based Texas Civil Rights Project sent this letter to Taylor school Superintendent Bruce Scott, Williamson County Judge Dan A. Gattis and the T. Don Hutto Residential Center warden demanding that the children held at the "center" be given the seven hours of daily instruction as required by the Texas Education Code. "As you know, state and federal law requires undocumented immigrant children be provided with educational opportunities equivalent to programs provided to other children," Medlock's letter states, citing a U.S. Supreme Court ruling in Plyler v. Doe. Schools Superintendent Scott and officials from the Williamson County referred questions to the Immigration and Customs Enforcement Agency. A spokeswoman for that agency said that they were investigating and had no comment. The T. Don Hutto Residential Center in Taylor, Texas is a for-profit facility owned by Corrections Corporation of America (CCA), a Nashville based company. CCA has a major contract with the federal government to operate Don Hutto as a prison (or modern day concentration camp) for immigrant families. 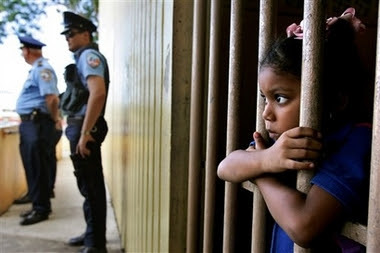 The 512 bed facility, which some refer to as a concentration camp, has been the target of a numerous protests against the practice of incarcerating children. Williamson County receives a "kick-back" for each person imprisoned at Don Hutto. Local residents and members of Texans United for Families, a coalition of community, civil rights and immigrant rights groups, have expressed outrage about the detention of families and children, saying it is immoral. 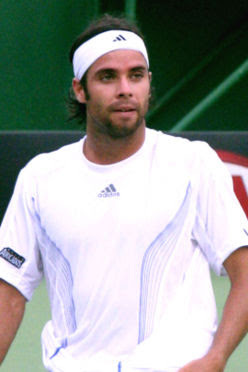 El Bombardero de La Reina ("The La Reina Bomber"), Fernando González of La Reina, Chile, shocked the tennis world on Friday by crushing Tommy Haas 6-1, 6-3, 6-1 in the semi-finals of the Australian Open. Gonzalez advanced to the finals where he'll match-up against #1 seed, Switzerland's Roger Federer. "[Federer]is the No. 1 player in the world by far. ... I lost many times with him," Gonzalez said. "But now I'm playing much better than the last time we played. And it's only one match. I'm going to give everything that I have to try to win my first Slam." Needless to say, American Taíno will be rooting for our Latin American brother--El Bombardero. We move to where the jobs are. We sometimes have to move away from family, and those who support us through times of trouble in our lives. Sometimes we don't speak the language of those around us. We are not always appreciated by our co-workers, bosses, or the clerk at the store. Sometimes we don't feel very safe in the neighborhoods we live in, or the weather is just too cold; both of which may keep us from wanting to go for a walk at night. This can lead to a sense of isolation. Isolation, and loneliness.....these feelings can lead us toward anxiety and depression, and a feeling of having little or no control of our lives. Might I suggest joining your local YMCA? The first time you walk through the door at the Y, you may be embarrassed to ask for a financial aid form to fill out. Yet there is actually money out there so that nobody is turned away due to a lack of financial means. You may feel shy when you start a step aerobics class, and don't know any of the moves. Your child may feel scared starting the summer program while you work all day. What you find out after participating day after day, and year after year, is that there are many members who feel, and have felt just like you. You come home after a rough day at work, and the first feeling you have is one of despair...of being lost in the world, and not knowing what to do with the kids. Did you know how much exercise, and just feeling like a part of the community can change that though? Family nights of swimming are free with a membership. Halloween parties are a good way for kids to meet others their age, and depending on where you live, may be safer than trick or treating. We were not meant to walk through this world alone. We were meant to be very important parts of the community at large. After you have been a member for a while, you may notice that your Y has needs just like you do. They rely on volunteers who want to work with children's sports teams, teach classes, etc. Why not volunteer? In the end, the person who benefits most is you. 'You've Got Mail' -- and it's anti-Latino! One of the great things about this country is that we have freedom of speech. That is truly wonderful. The sad thing is, there are times when I feel that if I actually use this freedom, and challenge people on things they say, in "exercising their freedom", I will somehow be the one to lose out by losing friends or potential friends, promotional opportunities, etc. I listen at work as my co-workers complain about our clients who can not speak English. I never say anything, and I try to ignore them. I am the only person on our team who speaks Spanish, and I offer to interpret whenever anyone needs me. caught on, all over the country...? UNITED STATES OF AMERICA ." "Press "1" if you speak English." "Press '2' to disconnect until you can"
Now, I am going to admit that I am a wimp. I am a wimp, because I find it easier to complain about things on the Internet, potentially to many people who I don't even know, than to address things that bother me at the source of the bothering. The above e-mail is just a sample, and is definitely not the worst thing I have received in my in box. Usually, I just quickly delete e-mails that I find off color or bothersome, and try to tell myself to consider the source, and move on. Here is my dilemma: If we repeatedly hear or see things that are offensive, and never speak up,and let people know that we do not agree with, or appreciate this type of thinking, are we just as guilty as they are? Or are we possibly even worse? New York has done it again. It has again stolen Boston’s hope. It started with the Babe going to the Yankees so many years ago; and the abuse has continued including the signings of Ace Pedro Martinez and all-star Johnny Damon by New York teams. This time New York has snatched Manny Rivera. No, not Ramirez. Rivera. As in Manuel Rivera--the former high school track star from New London, Connecticut. Yes, New York’s New America Governor, Eliot Spitzer, has signed the hugely talented Rivera after Boston believed that had him all sewn-up. But contract issues delayed Rivera’s signing in Boston and allowed Spitzer’s New America team to scoop him up—and at a bargain price. Of course, I’m referring to Dr. Manny Rivera, the outgoing superintendent of the Rochester School District in Upstate New York, and 2006 national Superintendent of the Year. The Harvard-educated Rivera, who’s has done two stints as superintendent in Rochester, separated by a decade as an Edison Schools honcho, is one of the country’s most highly sought-after urban superintendent. Co-Chairman of Governor Spitzer’s education committee, Dr. Rivera will join the new and promising administration as Chairman of a new Higher Education Commission. As he prepares to tackle what appears to the intractable state system of higher education, Governor Spitzer needs a smart and highly respected educator at his side. That’s Dr. Rivera. Governor Spitzer, Excellent pick-up for New York. Sorry Boston. 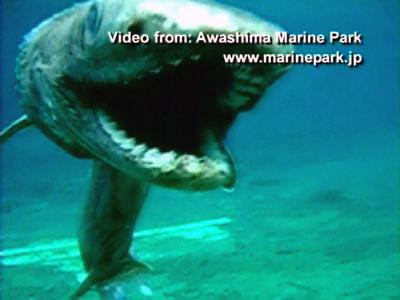 A rare prehistoric shark normally found 2,000 feet below the surface of the ocean has been caught off the coast of Japan. Upon closer examination, it was determined that the 5 foot, prehistoric shark caught without "papers" swimming way out of its depth, was none other than Littleton, Colorado Congressman, and U.S. Presidential wannabe, Tommy Tancredo. Authorities are searching for an appropriate caged habitat for big mouthed the creature. In a major breakthrough for Latinos in the commercial film industry, The Academy of Motion Picture Art and Sciences has nominated the largest number of Latinos for Oscar Gold for outstanding film achievements ever. This year's televised awards ceremony is February 25th at 8:00 PM EST. Here's another picture of the freaky weather we're having across the country. This one is from outside my brother-in-law's home in TUCSON, ARIZONA!!!!!! For those not lucky enough to have visited Tucson, please know that it's NOT supposed to snow there. It's also a wonderful city, and it's worth a visit. It's a terrific "Latino Heritage" City with Adobe and Spanish-style architecture in its historic section as well as in new construction. It's the quintessential Southern Boomtown with lots of sunny days, expansive out doors recreational offerings and a lively Latino presence. In terms of politics, Tucson is the progressive City in an otherwise conservative Arizona. Below are some of the great places and events that are are must when visiting Tuscon, the almost always City in of the Sun. In searching for the Tuscon Botanical Gardens, I drove by it numerous times because I was looking for something resembling a traditional garden with sprawling lawns and trees with large canopies. 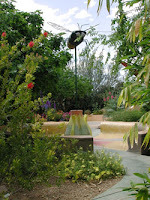 But the Tucson Garden is on a main thoroughfare tucked in behind a wall. It's small by botanic garden standards but its truly a gem. This museum is a real treat--it features animal and plant life from the Sonoran desert. It's also one of the best designed and most beautifully kept museums. 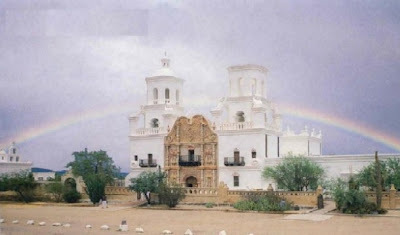 If you like history and/or religious sites, San Xavier has it all. This place was built in the 1600s as part of the Spanish missions push into the upper reaches of what was once New Spain. It's purpose was to bring Christianity to the Indians of the area. Even today the mission provides a school for Tohono O'odham children. If you have children, they'll love this place. First, it's huge. Most of the displays literally sit on desert grounds and are fully intact. And there are additional displays inside in a number of buildings. My favorite was the JFK's Air Force One. It's smaller than the photos suggest and the technology is so antique, but it was in that 727 that JFK and LBJ flew. The Sabino Canyon is a cool place to visit. It sits high in Catalina Mountain and it offers great views, wonderful hiking, swimming holes and a nifty trolley excursion. It also has a fabulous nature and gift store. However, they do warn people to be on the look out for mountain lions. The Tucson Rodeo Parade begins the 2 week "La Fiesta de los Vaqueros" or celebration of the Cowboy held annually in February since 1925. The parade is the country's longest wagon train of wagons, cowboys on horseback, stage coaches, Indian riders, show horses, beauty queens and marching bands. The parade lasts 2 hours and the crowd numbers in the tens of thousands. I love astronomy and I loved Carl Sagan. His book The Dragons of Eden, Speculations on the Evolution of Human Intelligence is superb, as was his series on the universe called Cosmos: A Personal Voyage. His book Pale Blue Dot: A Vision of the Human Future in Space was a sequel to Cosmos and in it Sagan described what was known about the unverse at the time. 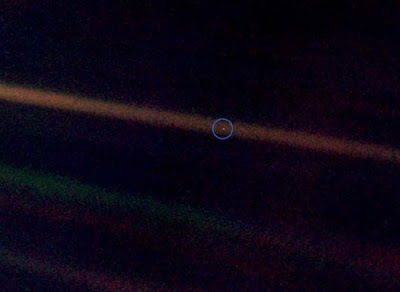 The title came from this photo of the Earth as seen by Voyager 1 on June 6, 1990 from a distance of 4 billion miles. Of the "pale blue dot," Sagan said, "That's here. That's home. That's us. On it everyone you love, everyone you know, everyone you ever heard of, every human being who ever was, lived out their lives. The aggregate of our joy and suffering, thousands of confident religions, ideologies, and economic doctrines, every hunter and forager, every hero and coward, every creator and destroyer of civilization, every king and peasant, every young couple in love, every mother and father, hopeful child, inventor and explorer, every teacher of morals, every corrupt politician, every 'superstar,' every 'supreme leader,' every saint and sinner in the history of our species lived there — on a mote of dust suspended in a sunbeam." Talk about putting things in perspective. Maybe this will help us get over ourselves. In The Lady Wants The White House, Times Online today examines Hillary's quest for the the presidency in '08. 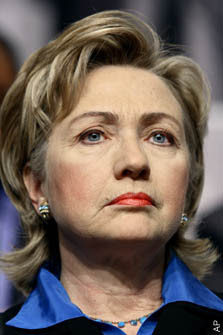 It points out that Hillary seeks to present herself as the American version of Margaret Thatcher. Margaret Thatcher's toughness worked politically because she, like Ronald Reagan, believed in the supremacy of the Anglo-American approach to capitalism and democracy. They were supremely confident in the future because they believed that the Anglo-American way was by far superior. They were tough because they were unfailingly optimistic in their pursuit. But how wearable is toughness devoid of optimism? And how can you be optimistic if you're not sold on America's basic principles? Hillary is a deconstructionist by nature; she wants to tearing down in order to rebuild based on new values. Margaret Thatcher was a conservative; she believed that what would Britain great again was to embrace it's very Britishness and return to its core beliefs. For example, Margaret Thatcher sought to fix Britain's ailing health care system by returning to individual choice and market-based accountability. Hillary sought to fix health care in America by adopting a France-styled socialized system. Very different philosophies and, therefore, very different political approaches are required. Thatcher started with conservative leaning "middle" England with her; while Hillary starts with the support of "progressive" left. I do believe that voters--men and women--would go for an American version of Margaret Thatcher. That's why Condoleezza Rice gets such positive reviews. But there's no one running that's a Margaret Thatcher type politician. Actually, the person closest isn't even a woman--it's Rudy Giuliani. A point in the article that I have no argument with was in the use of the phrase "the Magic versus the Machine” to refer to Barack Obama (the Magic) versus Hillary (the Machine). That seems to me to be right. The good news for Hillary supporters is that the magical candidate almost never wins. Almost always the victor is the candidate with the more formidable organization, the establishment candidate and the candidate that's more "machine-like" in their pursuit. I thought it important to comment on this interesting post Mmm....Immigration Doughnuts because it speaks to the important role immigrants play in spurring innovation and wealth creation in this country. While relatively unknown in Cambodia, these refugees from Southeast Asia have harnessed America's love affair with the doughnut into an engine of upward mobility. They are giving their American customers a much better product at a better price. Another example is how East Indians have transformed and dominated the news stand. Virtually all of these establishments are owned in the Northeast by East Indians, and they're not the stands of old. News stands such as Hudson News come in all sizes but they're all well-lit and smartly designed. And of course Koreans reinvented the fruit stand into a lucrative trade that's dominated by immigrant members of their group. It's good old American Ingenuity. The difference now is that that ingenuity is increasingly coming not from the more complacent "traditional" Americans but from new Americans, i.e., Immigrants. 1) Many of the Cambodian customers are Latinos since the stores are in California. Prime beneficiaries of immigrant entrepreneurialism include other immigrants. 2) Latino immigrants have focused on labor intensive industries thus far. This was the same path taken earlier by Irish and Italian immigrants. But just as happened with those groups, Latino immigrants are increasingly finding their ways into founding their own entrepreneurial enterprises, including lawn service, construction and restaurants. 3) Latinos are beginning to dominant small business development in communities across the country. Mostly of the mom and pop variety, but more sophisticated types as well. For example, a friend of mine is growing a business that produces the content for new video games. He started as an action hero illustrator. It's clear that becoming the best in a niche market is an excellent entry and growth strategy for immigrant groups; and starting as workers and progressing to ownership has advantages. Finally, immigrants are proving that even today businesses can be started with very modest amounts of capital. Americans often look for qualities in a new president that are missing in the old one. A classic example was when voters chose Ronald Reagan’s optimism and hawkishness after Jimmy Carter’s gloominess and defeatism. Let’s call this the “Opposites Theory” (OT) of presidential candidate preference. So I’m thinking that if it’s true that GWB’s administration has aided the polarization of Americans—and there’s good evidence that they have, and if their Neo-Con shaped foreign policy is undermining America’s standing in the world, might American voters this time around want a new commander-in-chief that’s a consensus builder with real diplomatic skills? If OT is true, and if it applies to the 2008 presidential race, won’t candidates perceived as too polarizing (Clinton, Tancredo, Edwards) and/or too hawkish (McCain, Giuliani, Hunter) ultimately fail with the voters? When the OT dynamic starts to kick-in, won’t it play to the favor candidates that are consensus builders (Richardson, Thompson) and/or diplomatic by nature (Obama, Romney, Vilsak)? Of course, real candidates are rarely one-dimensional. That is, they bring both strengths and weaknesses to the table. Also, voters’ perceptions of a candidate’s strengths and weaknesses matters greatly. That’s why we’ll see Clinton and Giuliani showing their warmer sides, and Richardson, Romney and Obama showing some toughness. While the early money is again on polarizers and hawks, it’ll be interesting to see whether those turn out to be good investments. For my money, I’m betting on the OT. In his first interview as Chairman of Republican Party, Senator Mel Martinez answered reporters’ questions on a variety of topics. Here’s his response to the inevitable question regarding his plans for attracting more Latinos and African Americans to the GOP side. Q: How will you try to make the party more inclusive to Hispanics and others? A: I will talk about the need for the party to be inclusive, to reach out to those who sometimes have not felt like our party has not left the door open to them and to also convey a message of our party that speaks to those groups. … I talk about the party of Lincoln, Roosevelt and Reagan being a party that is very much a party that I think that Hispanic-Americans and African-American both can be very comfortable in. Click here from the full interview. Hmmm. A Latino Chairman of the Republican Party promising to create a party in which Latinos as well as African Americans are comfortable is refreshing. Certainly, Bay Buchanan and Tom Tancredo can't be lovin what they’re hearing. The Democratic candidate with perhaps the most impressive resume is Bill Richardson–and tomorrow he joins Barack Obama and Hillary Clinton in pursuit of the Democratic presidential nomination. Richardson becomes the first Latino to pursue the nomination for the U.S. presidency. His entry makes the 2008 Democratic field even more historic. Currently serving a 2nd term as Governor of New Mexico, a key in the critical Mountain West region, Richardson is well positioned to flip the Mountain West into the Democratic column. He won re-election in November with 66% of the vote, and he was elected by his fellow governors as Chair of the National Governors Association. Prior to becoming governor, Richardson served as Ambassador to the United Nations. He served as Secretary of Energy in President Clinton’s administration. Before that he served 7 terms in the U.S. House of Representatives. 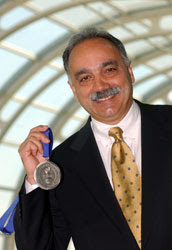 Richardson is author of Between Two Worlds: The Making of an American Life, a book about how his multicultural heritage shaped his life and his career as a political leader. After graduating from Tufts University in 1971 with a master's degree in international affairs, Richardson worked first as a congressional aide and then for the State Department. He was a staffer for the Senate Foreign Relations Committee prior to launching his political career. Richardson was born in Pasadena, California. His father was an international banker from Boston; his mother was Mexican. He spent his early childhood in Mexico City, where his father worked for CitiBank. Richardson attended a boarding school in Concord, Massachusetts, where he was pitcher on the baseball team. With the exception of a security breach at the Los Alamos Laboratories under his watch as Secretary of Energy and his involvement in relocating Monica Lewinski to New York City as a favor to his boss Bill Clinton, Richardson’s record is clean. He’s a political moderate with progressive social views combined with pro-growth fiscal stance. He’s an expert negotiator skilled in working with people from across the political spectrum. While he’s currently in the single digits in the polls, Richardson can surprise. He’s likable, knowledgeable and experienced, and he'll play well in all of the Latino heavy states, including, California, Florida, Texas, Arizona, etc.). Richardson can either win it outright, especially if the better known candidates stumble; or he’ll claim the VP spot. Either way, Richardson is someone Americans are going to hear a lot about. I’ve noticed lately that the MSM has run a lot of stories on the “growing” tensions between Blacks and Latinos. Just last week, I saw a story about a race riot in California between Blacks and Latinos. I’m reminded of an incident that happened as a child. While visiting my beloved Anglo grandmother, she says to my aunts and uncles, as she kind of laughed: "It used to be the Whites and Blacks beating each other up in the city high schools, but now it's the Blacks and Latinos." Strange.....I hadn't noticed that at my school. Years later while living in Wisconsin, my Anglo ex recounted how, in an effort to “diversify” the workforce at the factory, his bosses hired local African Americans workers. They were then promptly dismissed supposedly because they didn’t “work out.” The new solution? To bus in Mexican laborers from out-of-state. In support of this labor strategy, former Mexican President Vicente Fox expressed his view that Mexican workers come to the U.S. to do jobs that even Blacks don't want to do. I was shocked. No - I wasn't shocked over what he said. I was shocked that Americans everywhere in the media acted like that was the first time anyone ever said that out loud. Now, I had worked for State Unemployment for several years, and was specifically hired to work with migrant laborers. Usually they worked in food processing plants, or meat packing plants. The factories recruited the workers to come up and work seasonally. It was common knowledge that the Mexican workers would work for less, and under more dangerous conditions than Americans. That's why they’re recruited, right? Unfortunately, there is truth in the fact that when you have people competing for the same housing, employment opportunities, etc, things can get tense, and along with it, resentment and sometimes distrust can build. Add language and cultural differences, and you have a potentially explosive situation. Finally, there’s a young, female African American social worker I know, speaks Spanish. "Do you ever practice your Spanish with your clients?" I asked her. "No." Then she went on to say that many Latinos don't like it when she speaks Spanish to them. That is a shame. In this day and age of "English-Only" agendas, and rationalized distrust of Latino immigrants, when someone tries to converse with us in Spanish, we feel suspicious, distrusting, offended or whatever the feeling is? "Yet for all these markers of social dysfunction, fatherless Latino families differ from the black underclass in one significant area: many of the mothers and the absent fathers work, even despite growing welfare use." Is this supposed to be a way of complimenting Latinos, after putting them down for several paragraphs? Is it supposed to make us say, Oh, yeah....at least we're not Black!? Or is it what it is: a sign that the writer pretty much generalizes the lives of all Latinos and Blacks into one trash pile of mess! What Latinos need to remember is that, if it hadn't been for some of our great, African American civil rights leaders like Frederick Douglas, Rosa Parks, Martin Luther King, Andrew Young and many others, who spent and continue to spend their lives working for equal rights for all people, we would not have many of the opportunities that we have today. While we may not be able to change the thinking of bigots, we can make a conscience choice not to be like them. No matter what our circumstances in life, we can make a choice to respect differences in people, and learn from each other. We can do our part to live Martin Luther King's dream, and try to "judge people by the content of their character, and not the color of their skin." What can possibly bring groups with such different political views and agendas such as the U.S. Chamber of Commerce, U.S. Conference of Catholic Bishops, National Restaurant Association, Service Employees International Union, UNITE HERE and President G.W. Bush? That is, the sensible reform of the country’s antiquated and hypocritical immigration system. This coalition, which also includes leading immigrant advocacy groups such as the National Council of La Raza and the American Immigration Lawyers Association, this launched a renewed effort to get push immigration reform “over the finish line” in the now Democratic-controlled Congress. Last year, the coalition supported the John McCain and Edward Kennedy’s proposal, which among other things provided a “pathway” to citizenship for resident undocumented workers. While it gained the support of the President Bush and the Republican-controlled U.S. Senate, it stalled in the U.S. House of Representatives when Republican Tom Tancredo and his anti-Latino immigrant caucus worked to defeat the bill. With the rise of Democrats in Congress and the defeat of anti-immigrant congressmen such as J.D.Hayworth (R-Arizona) and George Allen (R-Virginia), it’s believed that the passage of a comprehensive bill is now a near certainty. However, the anti-immigrant caucus is not without allies. Also opposing the reforms is the 53-member AFL-CIO. It’s expected that the McCain-Kennedy bill, first introduced in 2005, will be the starting point for this year’s discussions. That bill sought to grant legal status and eventual citizenship to most illegal immigrants after they pay fines of $2,000, pass criminal background checks and meet English and civics requirements. It also would create a guest-worker program to bring in up to 400,000 workers a year to fill low-skilled and unskilled jobs. The fact that President Bush, Chairman Mel Martinez, Senator John McCain and others in the Republican Party are in support of sensible reforms will help the help distance the GOP from the anti-Latino immigrant bigots. As expected, Senator Hillary Clinton (D-New York) today announced the formation of an exploratory committee to run for president. Declaring that there are big questions (re: ending Iraq, cleaning the environment and fixing social security), Senator Clinton invited everyone to join her in a series of on-line "chats" to talk about them. Furthermore, she asked listeners to join her in "breaking barriers" because it's "our chance to say 'we can' and 'we will'." 1) Announcing an exploratory committee when everyone knows she's beyond exploring and has actually been running now for a couple of years is pretty silly. Some will say yes, but this allows her to raise money without officially announcing that she's running. Then what have all of those "committees" about that have raised $70,000,000 been about? 2) It's probably smart to be the women's candidate in the Democrat primaries. The thinking is that her opponents will split the male vote and none will be able to contest for the liberal activist female vote--which Hillary has locked up. The problem is in then appealing to a general public which is not so keen on supporting someone simply because they're the darling of NARAL, Planned Parenthood and NOW. 3) While the "chats" strategy worked in New York State because she really didn't know the state, it seems odd to use it for a national run. Afterall, she was First Lady and has toured the country extensively "chatting" with people. The other is that while all candidates want to "chat" with voters in order to sell their candidacies, reaching out through the use of impersonal Internet "chats" seems to only solidify Hillary's less than warm persona. Finally, I can't help but think that as someone perceived to be cold, calculating and ruthless, to set-up today's announcement by first taking a below-the-belt swing at your lead opponent and colleague, Barack Obama, is stupid. I'm referring to Clinton's suggestion that there's something torrid about the fact that Obama attended school for two years as a boy in Muslim Indonesia. In contrast to Hillary's harshness, note what Latino, Governor and presidential hopeful, Bill Richardson, had to say this week about Senator Obama: He's an “exciting candidate.” Here, here!!! Ignoring the demands of the "Blackboots" wing of the party, the Republican National Committee went ahead today voted to make Senator Mel Martinez General Chairman. The vote is historic in that it's the first time a Latino has become the leader of a major American political party. Unfortunately, in the run up to today's vote a not so quite campaign was undertaken to defeat Martinez. Rooted in a fierce anti-Latino bigotry, opponents went so far as to set-up an anti-Martinez website (StopMartinez.Com)and peppered GOP and conservative websites with all sorts of alleged Martinez sins, including: being a former Democrat, supporting Senator John McCain's immigration reforms, and being Cuban American heritage. Clearly, wiser heads prevailed and now the party, which lost big time this past November due in no small measure to its harsh anti-immigrant rhetoric, can begin figuring out a wiser path. However, the bigots will not simply disappear. If anything, they're likely to double up efforts to undermine Chairman Martinez, McCain, Giuliani and any other Republicans with constructive positions on issues such as immigration and equal opportunity. Wonder when he will give his first lecture on 'diversity', 'multiculturism', etc. and call us all bigots and racists. To move forward, the GOP should take this historic opportunity to boot bigots from its ranks. The GOP may see itself as a big tent party, but it should not be so big that it shelters all sorts of bigots and racists. With the ascension of Senator Mel Martinez, and the rise of moderates such as Rudy Giuliani and John McCain, the GOP should return to its Abraham Lincoln roots and rid the GOP house of its bigoted rodents. This move is essential because if the race card is used to deny Barack Obama the Democratic Party nomination, the GOP will want to create a pathway for African American voters to crossover and vote for the GOP ticket. Denouncing bigotry and expelling racists such as Tom Tancredo and the Buchanans is a must. Yesterday, I wrote a post about a poll allegedly done by the Miami-based Encuesta Organization, a market research firm focused on the Latino population. Their poll supposedly shows that Latinos favor Hillary Clinton over Barack Obama by a wide margin. However, the "poll" is so shoddy in every conceivable way that it seems that the people that did it are more interested in manipulating Latino opinion rather than in honestly tracking it. But here's a poll with real integrity. It was conducted January 15-17, 2007 and it surveyed 502 Republican and Democrats from New Hampshire on their primary preferences. By Zogby International, the poll has a margin of error of +/- 4.5 percentage points. The poll shows that Obama has opened a small lead on Hillary among the crucial Granite State primary voters; while John Edwards is now tied with her. This is bad news for both Clinton and Kerry since both are from the region. Kerry in particular should get the message and leave the field. Anytime a candidate starts to pull away is when rivals become start to throw mud in an attempt to cut them down. That's exactly what happened this week when FoxNews teamed up with Hillary Clinton's camp in questioning Barack Obama's ties to Muslims. Hillary's concerned that Obama isn't saying the truth about his religious heritage. That he's somehow keeping secret his heritage. The questions are supposed to cause Democratic party voters stop liking Obama and return to Clinton. Of course, the whole suggestion is complete and utter rubbish. Obama in his autobiography Dreams from My Father gives all in finite detail. His Kenyan father was a lapsed Muslim; and Obama did attend a Muslim school during the 4 years that he and his mother was lived in Indonesia because those are the schools that are available and his step-father during that period was a Indonesian Muslim. Obama himself is a Christian which is what his mother--the parent he grew up with--was. Senator Obama has handled this initial with the same dignity that I'm sure he's had to use against bigots throughout his life. But if his Democrat opponents can only find the same things that the ultra Right is alleging--that Obama and Osama look and sound too much alike--then we're in bigger trouble than I suspected. Here's yet more confirmation of Americans migrating out of the Rustbelt and into the sunbelt. 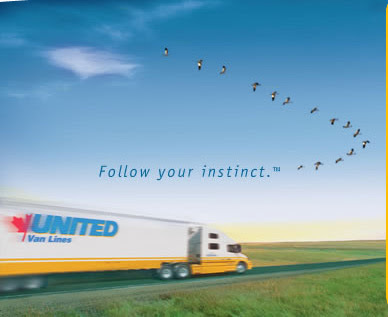 While these trends have been extensively written about here--especially as they relate to Latino migration, it's interesting information as the trends are based on actual moves conducted by United Van Lines. In 227,254 interstate household moves in the 48 contiguous states and Washington, D.C., the study classified each state as either "high inbound" (55 percent or more of the moves were into the state); "high outbound" (55 percent or more of moves out); or "balanced." Most states were "balanced," but 12 states and the District of Columbia revealed definite inbound patterns while nine states revealed the opposite. The South was a big draw as North Carolina came in as the top destination with a 64 percent inbound rate. Out West, Oregon was the second most popular inbound state at 62.5 percent. Other states with high inbound rates were South Carolina, 60 percent; Nevada, 59.9 percent; Idaho, 59.3 percent; New Mexico and the District of Columbia, 57.9 percent; Alabama, 57.5 percent; Utah, 56 percent; Tennessee, 55.8 percent, and Montana, 55 percent. On the outbound trail, Michigan tied with North Dakota for the top 66 percent outbound rate, followed by New Jersey, 60.9 percent; New York, 59.5 percent; Indiana, 58.2 percent; Pennsylvania, 57.0 percent; Louisiana, 56.4 percent and Ohio, 55.8 percent. Upstate New York, Pennsylvania, Ohio, Northern Indiana, Michigan and New Jersey are losing on a net basis 100,000s of thousands of residents each and every year. But the size of New York's outmigration is masked by the in-migration of immigrants. As reported earlier, New York State would have set the record for the single largest population outbound migration (with 1.2 million in just the last five years alone) if its New York City area hadn't received 800,000 new immigrants. One of the saddest moments of recent times was witnessing the utter incompetence of Governor Katherine Blanco's response to the devastation of Hurricane Katrina. Watching her during press conferences and interviews you could see that she was shell shocked. She simply didn't have mental focus or courage to lead in Louisiana's time of need. While I don't have the benefit of watching Puerto Rico Governor Acevedo Vila, it appears to me that he too is immobilized in the midst of his island's man-made disaster: escalating murders. Puerto Rico's murder rate was already sky high. Last year, there were 20 slayings per 100,000 residents, or 2.8 times the U.S. national rate (6.9) and 3 times New York City's rate (6.6). And things are getting much, much worse. In the first 15 days of 2007, island authorities report 46 murders in Puerto Rico, or double the number of killings during the same period last year. And what is Governor Blanco--I mean Governor Vila--doing about it? Well, the AP reports that he's thinking may he will and may be he won't call in the national guard. Shouldn't the guard and every available police officer (including all of the desk officers) have already been deployed? I mean, it is Puerto Rico's single biggest challenge of potentially catastrophic proportion if it is not addressed immediately and effectively. It's like having a field full of idle buses and while people are literally drowning in surging waters. Haven't we seen this picture before? Also, are Puerto Rico's governors, politicians and police afraid of the criminals? This is a reality in many places and maybe that's the case in Puerto Rico. The authorities pretend to be cracking down on the drug trade, but they'll only go so far. However, even more tragically, in some instances the authorities are actually profiting from the illicit activity. What accounts for Governor Vila's inaction? I don't know. What's clear is that he (as was the case with lightly talented Sila Calderon) appears clueless on ways to impose the rule of law on this island. Of course, Puerto Rico should've known what they were getting when they chose Vila as governor after presiding as mayor over San Juan's catastrophic rise in crime. Unfortunately, too many Puerto Ricans have also come to believe that politics is just a game and that it really doesn't matter who wins elections. The game is less on civic progress and more on which group gets to dole out gobernment jobs and contracts. But as we've seen in New York City's turnaround, the quality and courage of real individual leaders makes all the difference in the world. Having proven incapable of providing for the basic public safety needs of residents, Puerto Rico appears resigned to see a further erosion in its tourist trade, and a continuing emigration of its more talented residents. While Senator Barack Obama has become a leading a competitor to win the Democratic Party presidential nod, Latinos have yet to embrace him--at least that is what a "poll" circulating around Latino websites wants us to believe. In a poll allegedly conducted by Miami-based Encuesta Organization shows Latinos favoring Hillary Clinton at 56% versus just 15% for Barack Obama. The strange thing is that the results to do not mirror any of the national polls. What gives? - While the poll results were issued this week, the survey itself was conducted in October of 2006--way before the rise of Senator Obama. Poll results of more than a week are pretty much totally meaningless, and their release raises serious questions. - Senator John Kerry is shown in second place with 30% of Latino support. Given that Senator Kerry has been mired in the single digits for awhile, and enjoys virtually no support for a second try at the brass ring, it's highly suspicious that Latinos Democrats would view the senator so highly. - Another obvious anomaly is that the poll shows Latinos preferring Colin Powell for president on the Republican side. What? The fact that he's even presented as a potential candidate is beyond ridiculous. - But here's the clincher: The poll results are based on a sample of just 151 individuals of which only 32 were Latino. I'm not sure there's a margin of error large enough to assign to this travesty. So who is this Encuesta group and why are they putting out such a shoddy and misleading poll? The company's website claims that Encuesta is a specialist in Latino market research and that it provides services to corporate and political clients. While the website has a list of companies, it does not list any of its political clients. I truly hope that the poll is the work of some rogue individual and not a bonafide Latino research group. Actually, the shoddiness of the poll gives the appearance that it was a last minute tactic to get Latino media focused on the poll's "results" rather than on some other news. What news could someone want to have buried in the Latino media? Could it have been Obama's announcement? I think so. Unfortunately, slick political people--Latino and nonLatino alike--believe three things about Latinos: 1) we're easily manipulated and we're inclined believe anything that's fed to us in Latino media; 2) Latino media cares little about researching and verifying stories; and 3) a potential Black-Latino alliance can be easily subverted through misinformation and the exploitation of existing racial rivalries. I personally view the Encuesta "poll", the Encuesta Company (if they're involved) and the people paying for this gutter tactic as being beyond despicable. Unfortunately, we're likely to see more of this trash as the campaign season begins to roll. Given the importance of the 2008 election cycle to the future of the Latino community, my hope is that we Latinos not allow ourselves to be manipulated; that we do your research or at least listen to varying views; and that we don't go with something simply because it's in the media or because some Latino personality said so. But most importantly, let's not allow campaigns on either the right or the left to use the race card. Tommy: The Gods Are Not Happy! Is it just my imagination or do the gods seem to be angry? Since there isn't a "God Broadcasting Network", and no one would believe GBN's 'news you can use reports' anyway, the gods have to communicate in other, well, more god-like ways. My belief is that they communicate atmospherically. Of course, my idea is not original. Most world religions believe this, too. Yesterday it snowed in San Diego, California. Average temperature for this time of the year in San Diego is 66 degrees. The weather in the Northeast was spring-like until just two days ago. While the temperature is finally near normal for winter, but it has yet to snow where I live--and it's January 18th!!! There have been reports of dolphins found swimming into coastal inlets and rivers. Some are so disoriented that they have not been able to find their way back to the open seas. There are currently a half dozen dolphins nearby that marine biologists have been trying to free from an inlet, but the confused dolphins won't cooperate and now they're dying. Last week there were reports of hundreds of birds falling from the sky in Texas and thousands in Australia. In neither instance are authorities able to explain the causes of the mass deaths. The very serious Chicago Tribune carried a series of reports from a few weeks ago about a flight crew that reported seeing a disk hovering above Chicago. The FAA acknowledged the report but couldn't account for what it was. OK, the UFO may not fit, but many do believe that what people are actually seeing are not space ships but unknown atmospheric disturbances. Now some people say that these are signs of the prophesied end of the world. 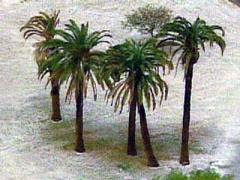 Others believe that it's more evidence of global warming. While others believe that the gods are expressing their deep unhappiness with people's inhumanity towards others. I don't know which it is, or whether it's all three, but it hasn't escaped me that things started to turn weird atmospherically when Tommy and the Know Nothings started going after Latino immigrants. The gods have a special affection for the indigenous people of the Americas and they don't take kindly to people picking of them. 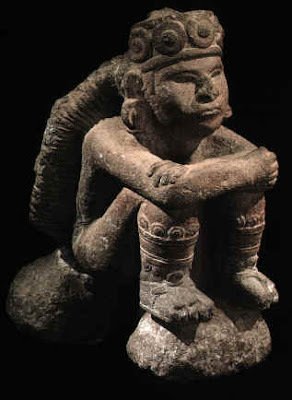 After all,the Mayan, Taino, Inca and the others have had the Sun god on their side for a long time. Tommy is so dense that he doesn't know that the gods are warning him to stop his nonsense. Having back-to-back major snowstorms and a massive avalanche hit Tommy's part of Colorado is not a coincidence. Tommy, Huitzilopochtli is not happy either. Which U.S. cities are travelers planning to visit in 2007? According to the search engine Yahoo!, the top ten are some of the country’s most ethnically and racially diverse cities. And with the exception of Honolulu, the cities all have significant Latino populations. So while Tommy Tancredo and his band of fellow haters have an aversion to these cities and their diversity, Americans from all walks of life are picking them as their preferred cities in which to spend time and money. Below are the top 10 cities along with the data (as per Wikipedia) on their respective racial and ethnic mix. 1. Las Vegas, Nevada: The racial makeup of the city was 69.86% White; 10.36% African American; 0.75% Native American; 4.78% Asian; 0.45% Pacific Islander; 9.75% from other races; and 4.05% from two or more races. 23.61% of the population is Latino of any race. 2. Orlando, Florida: The racial makeup of the city was 61.10% White, 26.70% African American; 1.43% Asian; 0.34% Native American; 0.08% Pacific Islander; 5.41% from other races; and 2.54% from two or more races. 17.79% of the population were Latino of any race. 3. New York City, New York: The racial makeup of the city was 45% White; 27% African American; and 10% Asian. 27% of the population were Latino of any race. 4. Honolulu, Hawaii: The racial makeup of the city was 19.67% White; 1.62% African American; 0.19% Native American; 55.85% Asian; 6.85% Pacific Islander; 0.89% from other races; and 14.93% from two or more races. 4.37% of the population were Latino of any race. 5. 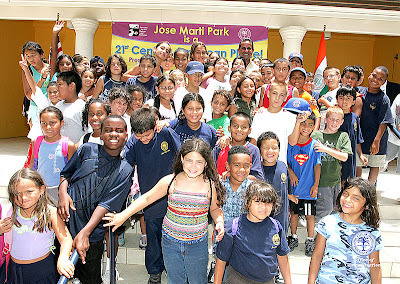 Miami, Florida: The racial makeup of the city was 66.62% White; 22.31% African American; 0.22% Native American; 0.66% Asian; 0.04% Pacific Islander; 5.42% from other races; and 4.74% from two or more races. 67.76% of the population were Latino of any race. 6. Ft. Lauderdale, Florida: The racial makeup of the city was 64.27% White; 28.88% African American; 0.23% Native American; 1.03% Asian; 0.05% Pacific Islander; 1.76% from other races; and 3.79% from two or more races. Latino of any race were 9.45% of the population. 7. Los Angeles, California: The racial makeup of the city was 41.9% White; 26.2% African American; 10.0% Asian; 1.4% Native American; 0.2% Pacific Islander; 15.7% from other races; and 5.2% from two or more races. 46.5% of the population were Latino of any race. 9. Phoenix, Arizona: As of 2000, the racial makeup of the Phoenix was 71.07% White; 5.10% African American; 2.02% Native American; 2.00% Asian; 0.13% Pacific Islander; 16.40% from other races; and 3.28% from two or more races. 34.06% of the population were Latino of any race. 10. Ft. Myers, Florida: The racial makeup of the city was 56.35% White; 33.39% African American; 0.38% Native American; 0.98% Asian; 0.10% Pacific Islander; 5.69% from other races; and 3.11% from two or more races. Latino of any race were 14.49% of the population. It's my pleasure to post Jenny's response to Heather Mac Donald's screech against Latinas in Hispanic Family Values?. By way of introduction, Jenny is American Taína with a dose of Irish--a wonderful combination: sensitive, smart and fiery when pushed too far. Unlike Ms Heather, Jenny actually knows a thing or two about what's going on with young women in America today. While Ms. Heather looks down at her subjects through the distortions of ideology, Jenny speaks honestly and with a good heart. OK, I can be accused of bias since I'm Jenny's uncle. But I challenge readers to prove me wrong. Jenny is now an official contributor to American Taíno, so look for more of what Jenny has to say in future posts. This was an interesting article about Latinos not having family values because Latino fertility rates are higher and Latinos are more likely to live without spouses. As far as the statistics go, I guess you can find statistics to support most arguments. I don't know too many right wingers who would say that Christians have lower family values than Atheists, but I suppose Atheists could use the above figures to support that argument. Birth rates dropped signicantly after the baby boom, and our elderly population is living longer. Our country actually needs more procreating parents, to eventually create more workers, to support our growing elderly population. Being a single parent is not always easy. I know that - I am one. However, many, many of the working women I know are also single mothers, and most of them are non-Latino. It would not be healthy for our country, or even accurate to say that this is "just a non-white problem" and ignore it. To say that Latinos tend to live without spouses, and are therefore lacking family values is a sweeping generalization, so my answer to why there are so many single parents will also be a generalization. I will blame it on "changing gender roles." Sure - there are probably many reasons, but I'll choose this one. So many single moms I know, of various ethnic backgrounds, feel that they are doing better economically than their children's fathers. Many women today tend to have higher education level than the men in their lives. With today's job market that often values consensus building and customer service over the traditional male roles of "hunting and gathering", we are many times more successful in the business world than our men. Yet many of us still want a man to provide for us. Maybe we get slightly resentful when the men in our lives do not seem to be able to do so. Maybe the men in our lives sense our resentment, and use that to fuel their already low self esteems from knowing they are not providing, and use it to fuel the bad decisions they choose to make. Maybe our significant others would like it if we folded and ironed their laundry, and stood at the door with a gin and tonic when they came home, wearing a smile and nothing else - but who has the energy to do that when you've worked 40+ hours, helped your kid with homework, and everything else. I do not advocate single parenthood as the best choice, however I do have a lot of hope as a single parent. Sometimes when we do not have a spouse or significant other to serve, it actually frees us to more fully serve the communities we live in. Haven't some of the most prominent female leaders in this country been single? Taking another step towards the Dream, U.S. Senator Barack Obama (D-Illinois) filed papers this week to form a presidential exploratory committee. Proclaiming that "Politics has become so bitter and partisan, so gummed up by money and influence, that we can't tackle the big problems that demand solutions. And that's what we have to change first." In a sign of the times, Senator's Obama's message was delivered via a YouTube video. Click A Message From Obama to hear and see the senator deliver him much anticipated message. Actually, his use of YouTube is an indication that Senator Obama's campaign is prepared to be creative in the way they reach voters and communicate his campaign's message. The Senator's youth and command of the written and spoken word gives him a tactical as well as strategic advantaged over his older and less dextrous opponents. I love this part of his message: "It's not the magnitude of our problems that concern me the most; it's the smallness of our politics." Here! Here! Shhhh. 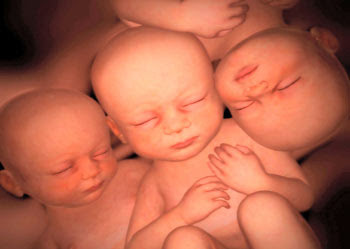 Don't tell Tommy Tancredo or Ms. Heather (Mac Donald) that these babies are Latino because they'll be forced to screech and carry on about how it'll doom the America that they know. But not to worry--the babies are British. 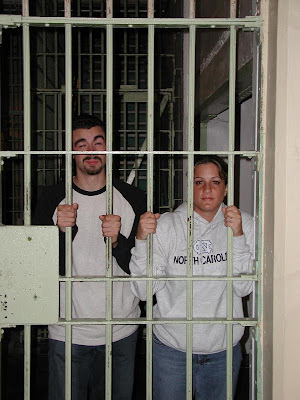 Tommy and Ms. Heather are O.K. with that. I mean, after all, the world could use more upstanding Brits, right? It's just too bad that they don't do grapes or windows--and cooking, well, that's not their strong suit. Good people though those Brits. Funny thing is when I try to imagine how a Tommy or a Ms. Heather think and talk, I assume a very infantile "I'm the center-of-the world" sort of persona. You know, a place where temper tantrums and pouting are common, and where the Ninja Turtles fight off the bad guys and save the world. Really. Seriously, Isn't this a truly amazing photograph? It's from an article on a new 4-D scan technology that allows doctors to see the smallest details of life as it develops in the uterus. Truly breathtaking photos. Tommy! Heather! Stop pulling Rosita's hair! Maybe the implosion is happening sooner than expected. 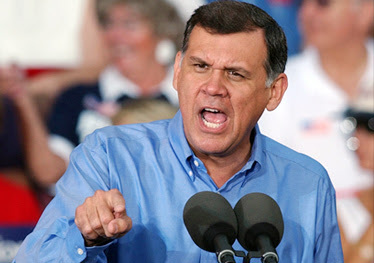 After Tommy Tancredo jetted to Florida for the express purpose of calling the heavily Cuban American populated City of Miami a third world travesty, now some of the dim bulbs on the Republican National Committee are seeking to dump Senator Mel Martinez as General Chairman of the party. Because Senator Martinez favors U.S.Senator John McCain's proposal on immigration, which includes a path to citizenship for those that live and work here and have children or spouses that are U.S. citizens. Apparently, the fact that Senator Martinez is an American citizen, member in good standing of the Republican Party, and a United States Senator from the politically critical state of Florida, doesn't inoculate him from being dismissed by the Right as a "foreigner" unworthy of being the Republican Party Chairman. Maybe Florida's Cuban Americans should consider a tactical realignment for 2008? What's there to lose? The Tancredo creatures will ensure the defeat of the GOP, anyway. I just cannot understand WyTF these Republican party honchos are so hellbent on the Latinizing of America!! So for those that continue to believe that the blackboots are stomping just for "illegals", think again. Senator Martinez is not an "illegal". He is however an American Latino. In her turn to kick Latinos where it hurts, Heather Mac Donald, a writer for the Manhattan Institute's City Journal, aimed her stilettos right at the womb of Latinas. Questioning Latino's commitment to family she wrote in “Hispanic Family Values?”, that Latinos threaten American society because of their high fertility rates and tendencies to live without spouses. As seems to be her employer's policy, Ms. Heather makes her points by relying on anecdotes and by misrepresenting the data. For example, yes the Latino fertility rate is higher then for nonLatino whites but is that really an assault on family values? Is it really anti-family to prefer 2 children instead of 1? But more importantly, the average age of Latinas is 25 years versus over 35 years for nonLatino whites. It is simple common sense to expect that the younger group of childbearing age women would produce more children than the older group. But Ms. Heather uses the higher birth totals for Latinas as evidence of being anti-family values. Ms. Heather is essentially arguing that because we have children (which we do tend have) that that's proof that we're falling short on family values. Confused, right? One thing that Ms Heather convenient leaves out of the discussion is the effect of abortion on childbirths. It's well documented that Latinas are less likely to terminate their pregnancies; which does result in a higher birth rate for Latinas than for Blacks or for nonLatino Whites. But is the preference to carry babies to term evidence of being pro-family of anti-family? By her silence on this issue, and because she clearly favors the lower birthrates of nonLatino White women, you are left to conclude that reducing the birthrate through pregnancy terminations is a sign of healthy family values. What about Ms Heather's claim that Latinas are spouseless, and that that is contributing to the doom of society? I happen to agree that fatherless children is not the best way to go. But do Latino families suffer from this societal phenomenon more than others? If you skewed the data you can show that there are proportionately more single Latina headed households than nonLatino White female households. But you'd have to do the following in order to get there: 1) compare apples to oranges. That is, compare a group of women which is significantly more economically challenged and younger with a group of women that's older and significantly wealthier. But if one did an apples-to-apples comparison what you'd find is that young Latinas (and most Latinas are young) behave similarly to nonLatina Whites. I'm willing to bet that for young, low-income white women--a generation for whom Brittany Spears is a role model--that steady marriages is not a strong suit. But here's data that should give Ms Heather some pause. The NYTimes today has a story 51% of Women Are Now Living Without Spouse showing that most women are spouseless--and that that figure has risen sharply over the last 2 decades. Even without accounting for a generational difference (which is a must in order to do a true comparison between the groups), the report shows that about 30 percent of black women are living with a spouse, according to the Census Bureau, compared with about 49 percent of Hispanic women, 55 percent of non-Hispanic white women and more than 60 percent of Asian women. So even with a much older group of women, women that are more apt to have "old fashioned" values, nonLatino White women and Latinas are statistically tied. What this tells me is that it's very likely that on ahead-to-head age group comparison that Latinas would be found to be more likely than nonLatina Whites to have spouses. I still am curious what the Manhattan Institute's real agenda is here. As in the Badillo case, Ms Heather distorts the data and uses anecdotes to paint a less flattering picture of Latinos. Heather goes after Latinas and tries to cause damage in an area that many argue does separate the typical Latina from her counterparts, but in a very favorable way, and that's as mothers and spouses. Badillo goes after disadvantaged Latino parents and argues that they simply don't care about their children's education. He denies his own experience in which as an orphan (and the nephew of his care-taker Puerto Rican aunt in the Bronx) he didn't have the benefit of parents with the time and capacity to be involved. 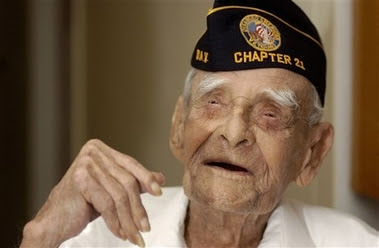 The truth is that he lucked out be attending school in the 1940's when schools will still schools. It's very sad that the Manhattan Institute appears to be adding to ethnic tensions by generating documents of questionable scholarship, and doing so on behalf of an agenda that appears to be less about illumination and more about putting down Latinos. It's even sadder that Badillo and Mac Donald are doing the dirty work for the handful of very rich men for whom the Manhattan Insititute is nothing but another instrument of their power. The Right’s problem with Latinos has really little to do with the issue of legal status. This is purely and simply about a dominant group, in stark and ugliest of ways, to put a new group in its place. It is therefore easy to see why they're especially eager to go after the Latino Parent--the very people most responsible for fueling the rise of the new contenders for power. Latinos were receptive to some of the Right's ideas, including school choice, pro-family policies, entrepreneurship, national security, relgious freedom, etc. But they are not enamored with blackboot politics, nor are they much interested in the politics of xenophobes, racists and economic elitists. The only thing left to do is for Latinos to support politicians that support them, and then watch the Right under the leadership of Tom Tancredo--or some such creature, implode in 2008. Don't Lose Your Mind: Become Bilingual! NY Latinos Are Fighting: Who's Really Winning? Rocky Balboa: Knock Down That Wall!